Carrot, the wonder vegetable, is rich in vitamin A and is good from the health point of view. It is even steamed, smashed and fed to babies as well. We also prepare a variety of dishes like vegetable salads, kosambari, halwa, carrot kheer, use it in rice dishes like the pulav, fried rice and also in sambar, veg kurma, veg sagu, etc. Today I would like to put up carrot chutney which can be served with rice and dal and curd rice too. 1. Wash and grate carrots, chop coriander leaves, peel ginger and garlic pods and keep aside as shown in image-1. 2. Place a skillet with 2 teaspoons of cooking oil in it on medium flame. When hot, add garlic cloves to it. When fried, add green chilly to it and fry it till done. 3. Now add grated carrots and fry for a while adding salt to it so that it does not get burnt. When done, add fresh grated coconut, ginger, tamarind, and fry for a while till it is done. 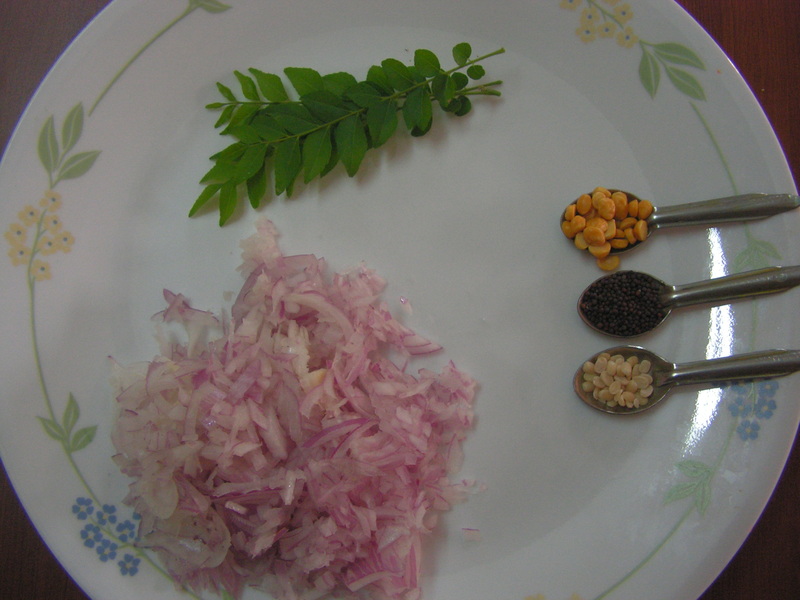 Switch off the gas and add coriander leaves, curry leaves also to it. 4. 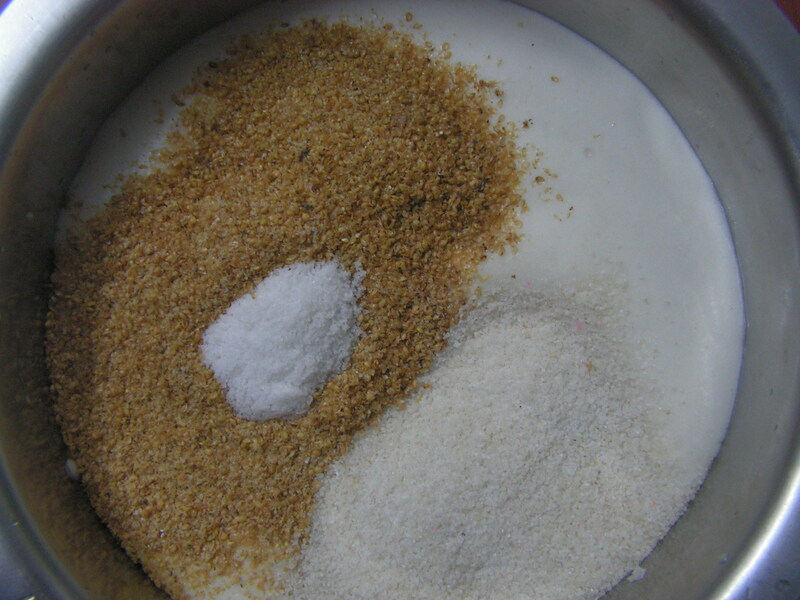 On cooling , grind the above mixture in the mixture adding required quantity of water in steps to a medium coarse consistency, checking for salt. 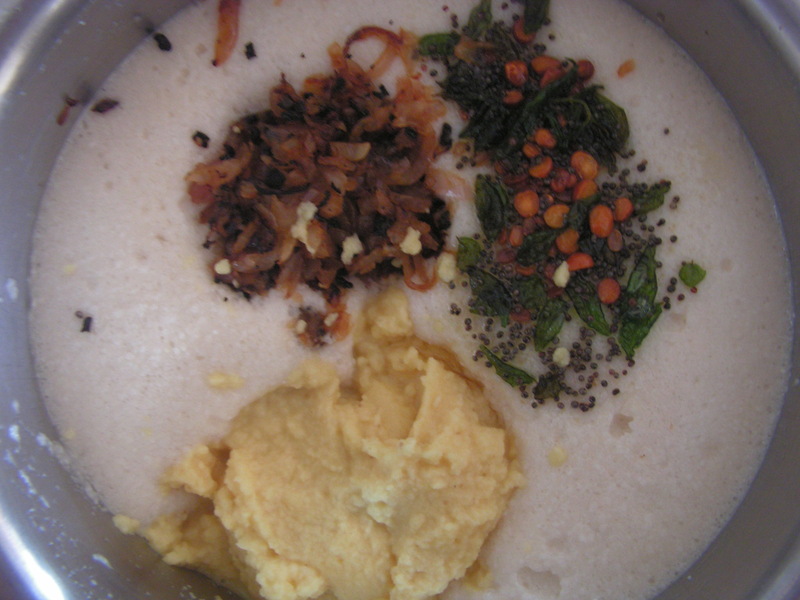 Serve with idli, dosas, and even with rice and rasam or dal. This entry was posted in Uncategorized and tagged 30 minutes, Breakfast, Dosa hut, Idlis, Side dish for Rotis, Tiffin, Wet chutney. Oats are very healthy. 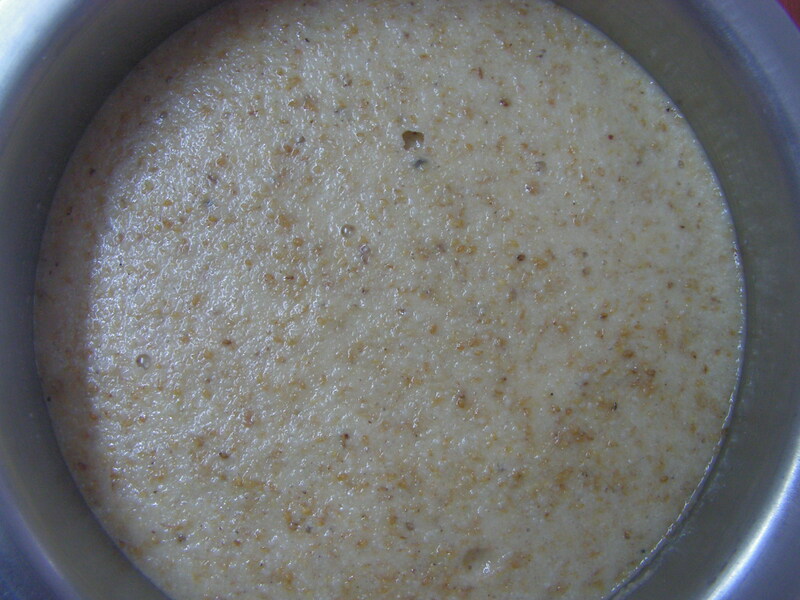 We have Oats for dinner by cooking it in milk adding some flavour like the milk chocklate or the chocolate powder is a well-known practice. 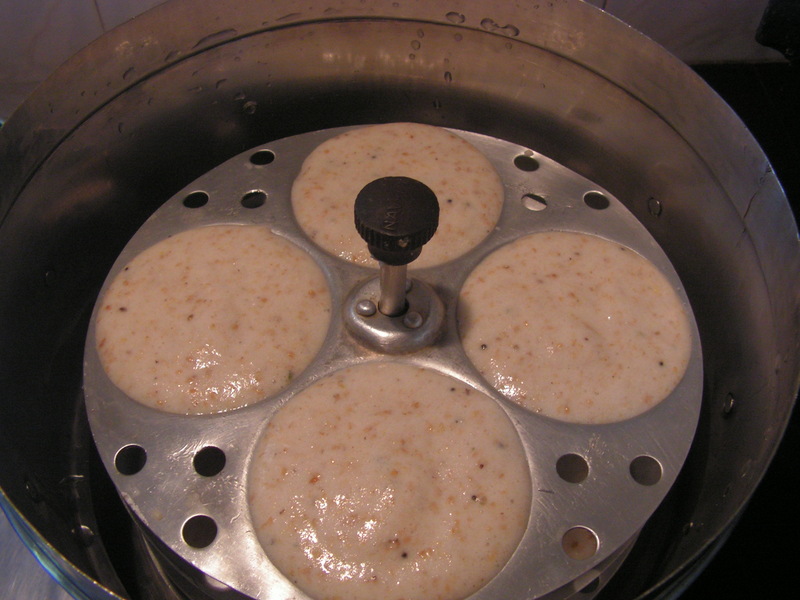 I would like to put up Oats Idli to add to the long list of Idlis I have put up on this blog. 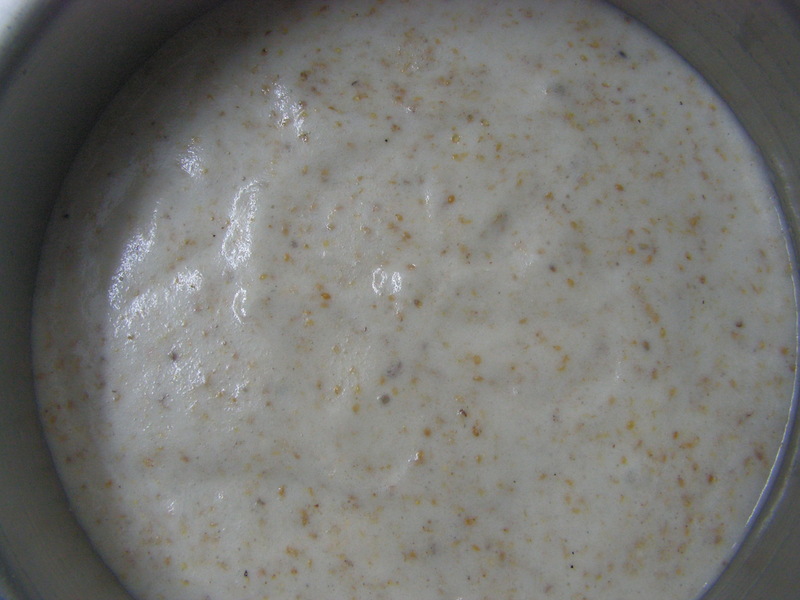 It is easy and can be prepared instantly without any soaking or fermentation. 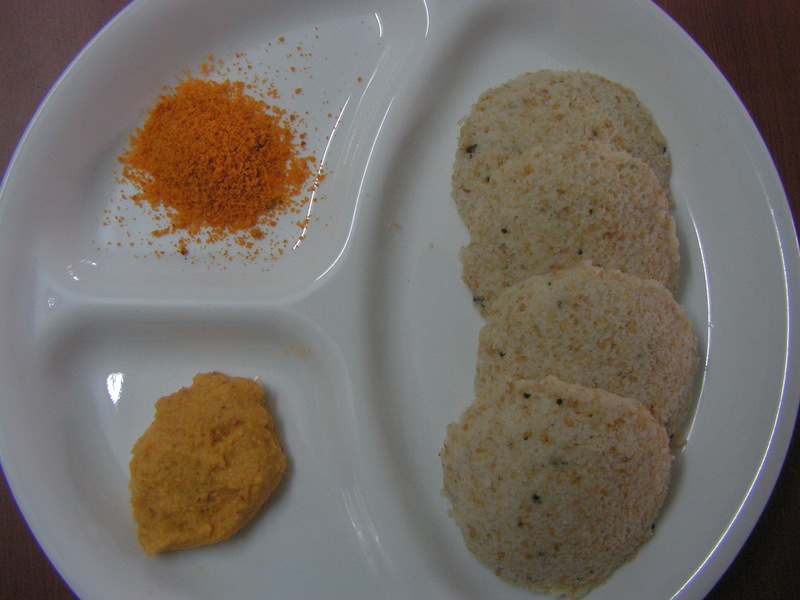 Here, by the way, are over a dozen varieties of Idlis posted on this blog earlier ! 1. 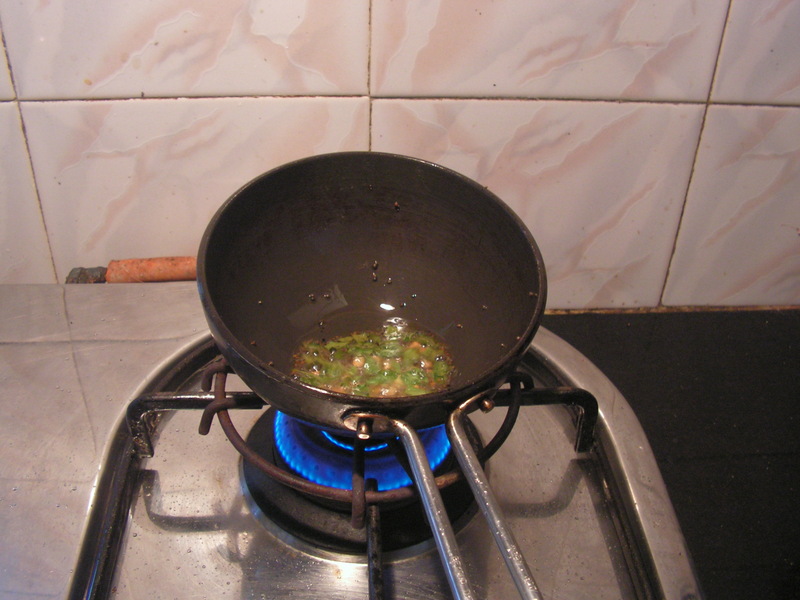 Place a skillet with 4-5 teaspoons of cooking oil on medium flame. 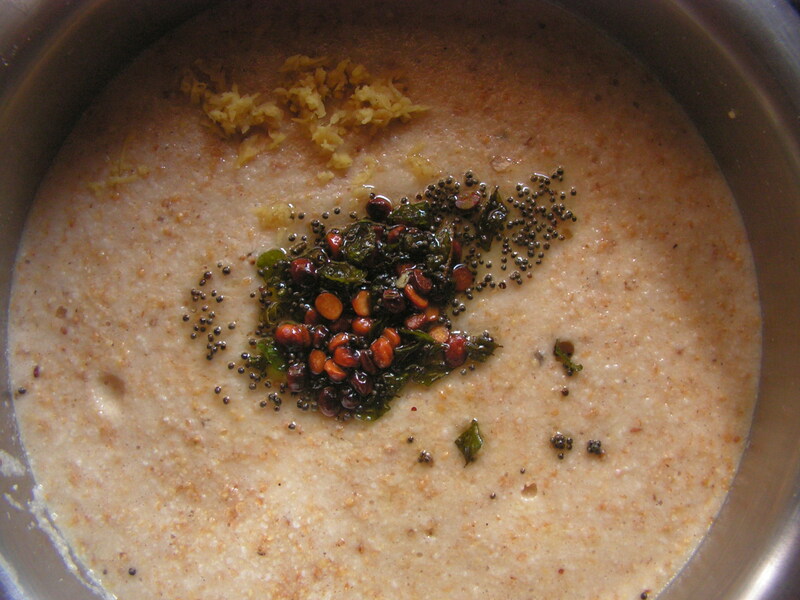 When heated, add mustard seeds and Bengalgram dal to it. 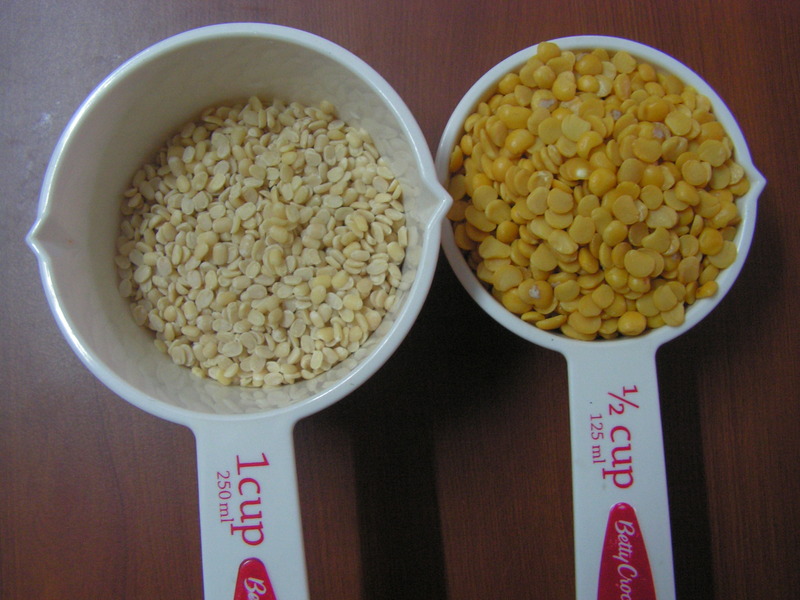 The mustard splutters and Bengal gram dal is fried. Now add chopped green chillies , dry fruits and when fried add Bambino vermicilli to it and fry for a while. 2. Add grated carrots to it and when it is half done add sujee to it and fry it till you get a nice aroma. By then the carrot would turn crimpled and it is the right time to switch off the flame and keep it aside. When it is a little warm add oats and mix it. 2. 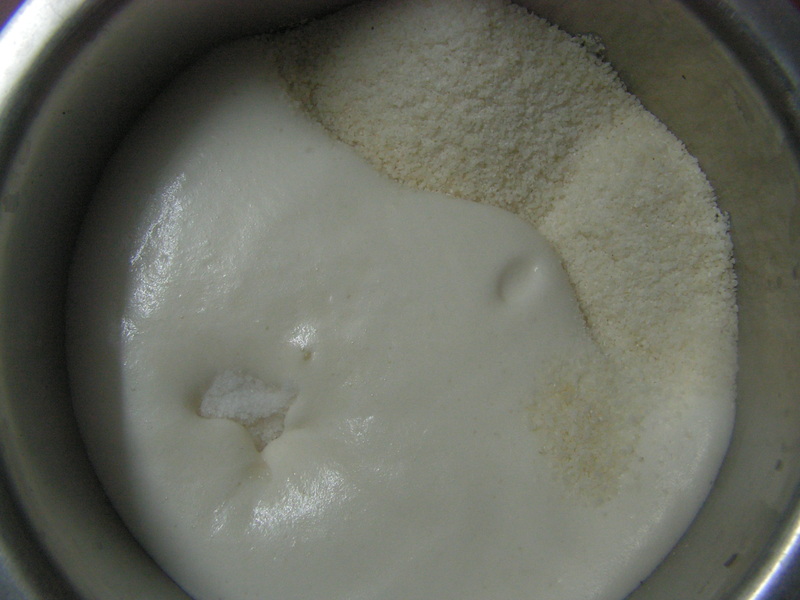 Beat curds in the mixer with a little quantity of water to it. 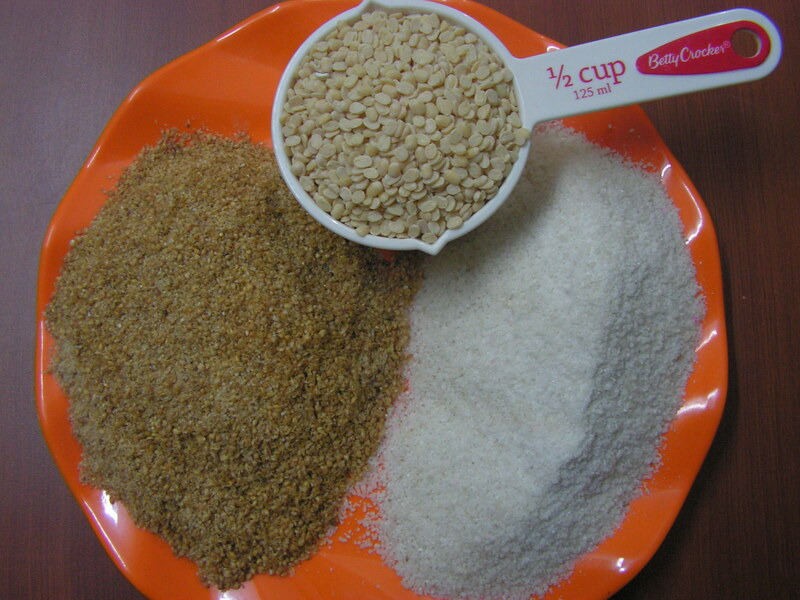 Transfer it to a broad bowl and add salt, cooking soda, a little sugar and stir in the above mixture from step 1 to it. Add chopped coriander leaves, a little fresh grated coconut and keep it aside for about 15 minutes. 4. 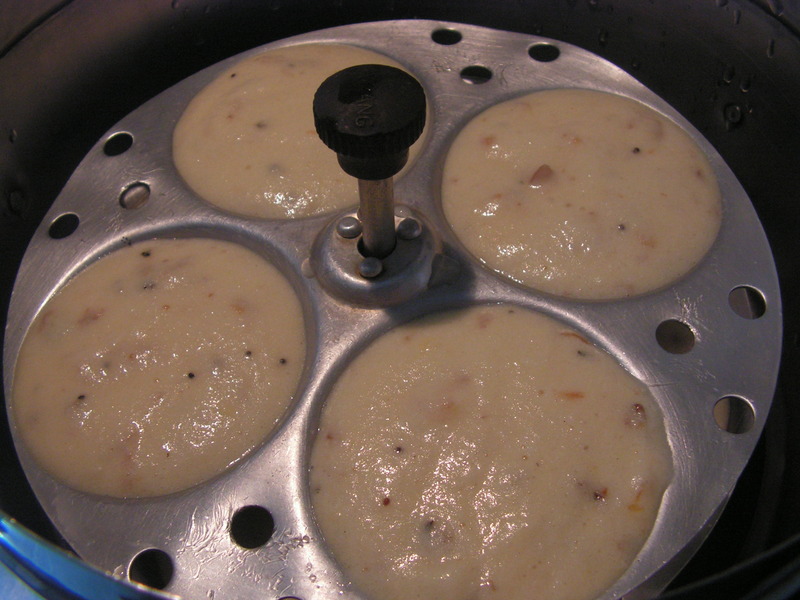 Fill in the dough in the idli moulds by greasing the same with either butter or ghee. Steam the same in the cooker as usual for about 20 minutes and is as below. 5. Enjoy with any wet chutney of your choice. Here are some wet chutney options if you want to try one of those. 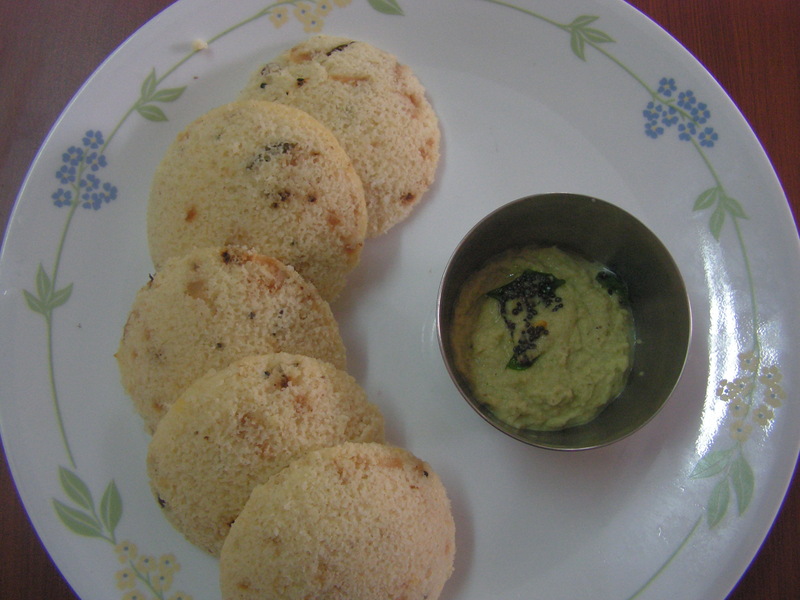 This entry was posted in Uncategorized and tagged Idlis.